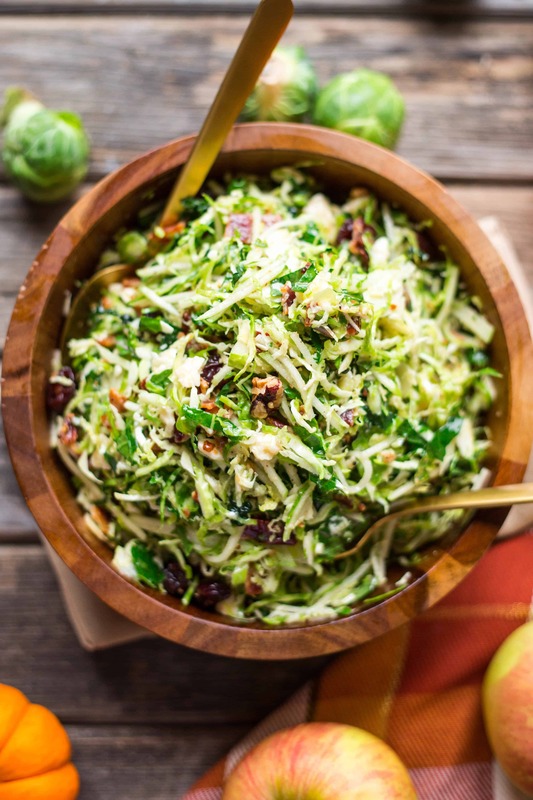 This Brussels Sprout, Kale + Apple Salad is loaded with raw, nutrient-packed veggies as well as a few indulgences. It’s on my Thanksgiving table every single year! This salad, or at least a variation of it, has been a solid staple of mine for the past few years. 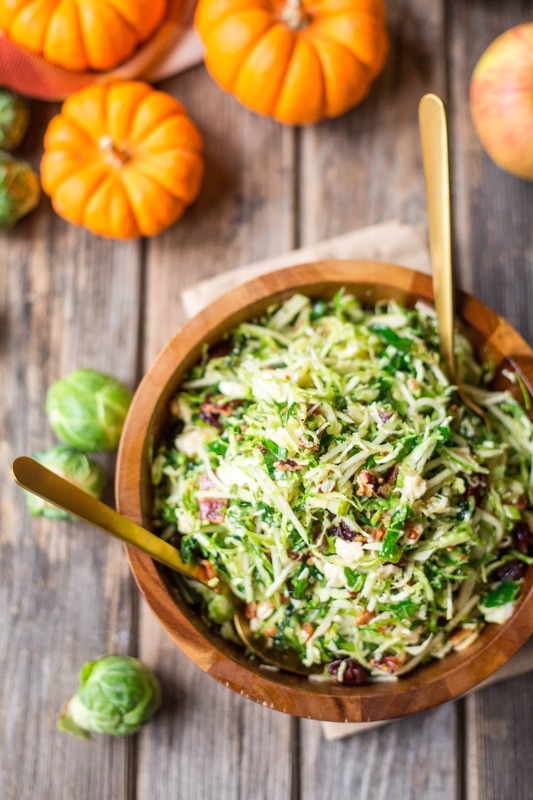 I’ve made it several times for Thanksgiving, and when I tell people what it is, they politely say, “uhh, thanks, but no thanks.” On a day devoted to gorging on rich and heavy foods, the words “raw,” “kale” and “salad” are usually not very well received. A few brave souls, lured by the words “bacon” and “sharp cheddar,” reluctantly dish a little bit onto their plates. Within minutes, word starts spreading around the table that, hey! This stuff is actually pretty good. By the end of the night, everyone is asking for the recipe, and I fancy myself a bit of a mic-drop / go-on-and-brush-your-shoulders-off moment. Problem is, I never actually wrote the recipe down, and of course, every time I made it I did something a little bit different. Sometimes I’d use only kale or brussels sprouts rather than both. Sometimes I would use walnuts instead of pecans or dried cherries instead of cranberries. Sometimes I used garlic instead of shallot in the dressing, with a different vinegar or a whole grain mustard. Sometimes I’d use a different cheese, and in fact, aged gouda and Prima Donna work exceptionally well (but they’re a whole lot pricier than sharp cheddar). Sometimes I’d leave out the bacon or add different veggies like carrots, beets, or roasted squash. Over the years, every time someone asked me for the recipe, I’ve had to try and remember exactly how I made it on the day they had it. I’d text them an awkwardly long and rambling list of ingredients and steps, often referencing this recipe and this recipe. It’s sort of a combination of the two, but also kind of it’s own thing entirely, which only serves to confuse people further. 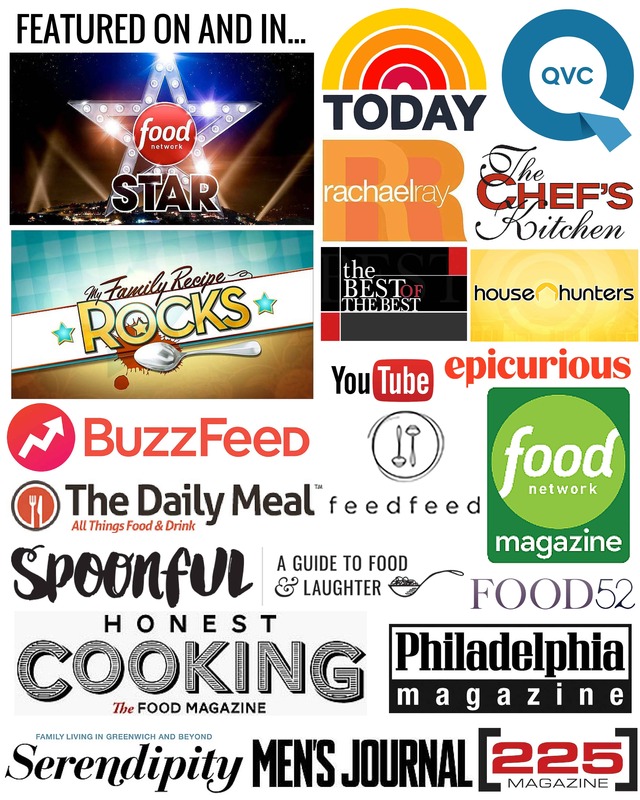 But now, the recipe is here to live for all of eternity, making both my and everyone else’s life a little bit easier. Oh, in case you were wondering… no. Despite all these cute baby pumpkins in the pictures, this salad does not actually contain any pumpkin. I was just having so much fun styling and photographing these teeny little pumpkins that day for other recipes and got a little carried away. I love the way that glowing orange shows up in photos and makes everything seem a bit more fall-like. I should mention that I recently bought a new camera. Well, it’s actually a used camera, but it’s new to me and very, very exciting. I’m now shooting with a Canon Mark D 5 III – for any photography geeks reading – and it was actually one of the very cameras used to photograph my wedding(!!). So far I’ve been having wayyy too much fun taking pictures with it. Shooting with a full frame camera is an absolute game changer. Even though this particular recipe doesn’t contain any pumpkin, squash or other veggies, it can totally be adapted to include some. I’ve especially enjoyed it with roasted squash lately. The recipe is so forgiving, I really encourage you to tweak it to suit your tastes and make it your own. You can’t go wrong. 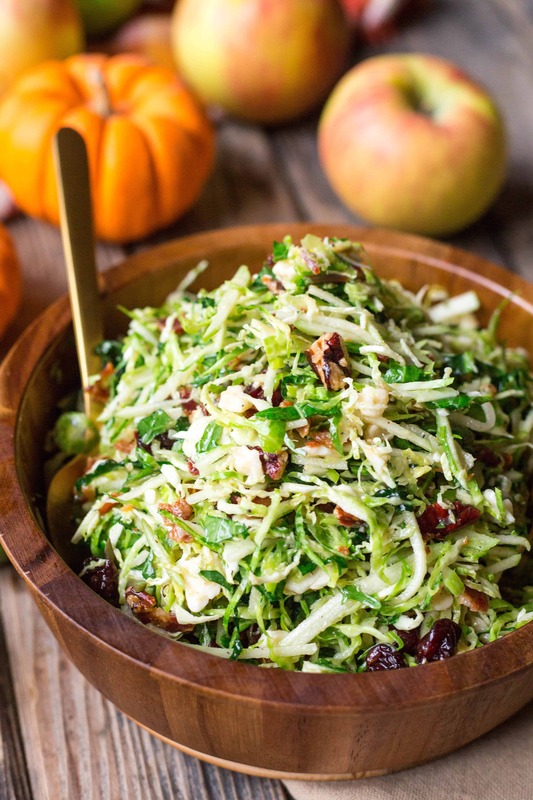 This salad is packed with flavor and is such a welcome addition to the Thanksgiving spread. 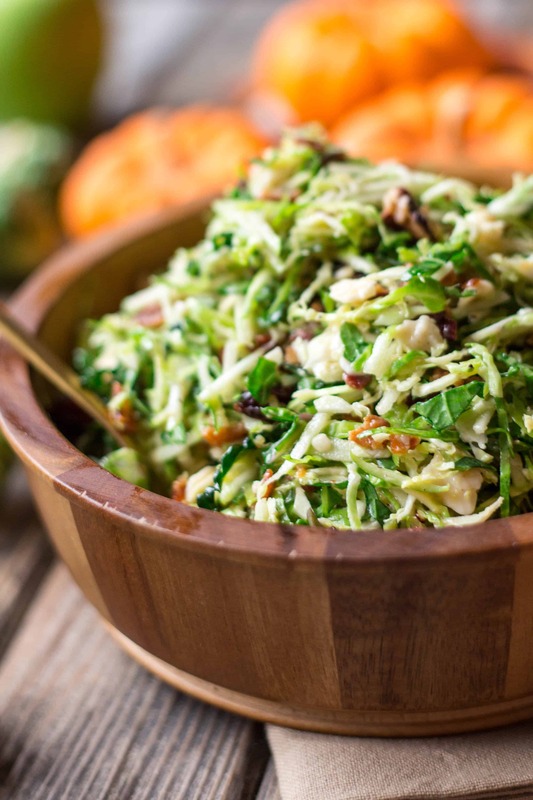 Among the stuffing, mashed potatoes, and gravy, it’s nice to have something that’s refreshing, crunchy and loaded with nutrient-packed raw vegetables. But even with all that healthy stuff going on, it still has the muscle to stand up to all the other indulgent and decadent foods on offer. It’s a salad for people who think they don’t like salad, and this year it might just be the most popular dish on your table. Clean and remove any brown or yellow leaves from the brussels sprouts. Use a mandolin to slice them very thin (alternatively, you can do this with a knife, but a mandolin makes the job much easier), then add them to a bowl. Remove the tough stems from the kale, then stack the leaves and roll them up like a cigar. Run your knife through them to make nice, thin ribbons, then add them to the bowl with the brussels sprouts. Drizzle with olive oil, sprinkle with salt, then use clean hands to squeeze and massage the greens until they're fully coated with oil and have reduced a bit in volume. Add the julienned apple, toasted pecans, dried cranberries, cheddar cheese, and bacon. In a small bowl, whisk together the shallot, apple cider vinegar, Dijon mustard, honey, salt and pepper. Slowly stream in the olive oil and bacon fat while whisking until the vinaigrette is emulsified. Taste and adjust seasoning as needed. Pour the vinaigrette over the salad and toss until everything is thoroughly combined. Serve immediately. This recipe is still great without the bacon and can easily be made without it if there are vegetarians in the crowd. Make the vinaigrette up to 3 days ahead and store in a jar, refrigerated. Bring up to room temperature and warm up slightly before using (to liquify bacon fat). Toast and chop pecans up to 3 days ahead. Store in a zip-top bag at room temperature. Cut the cheese into cubes up to 3 days ahead. Store in a zip-top bag in the refrigerator. Cook and crumble the bacon up to 3 days ahead. Store in a zip-top bag in the refrigerator. 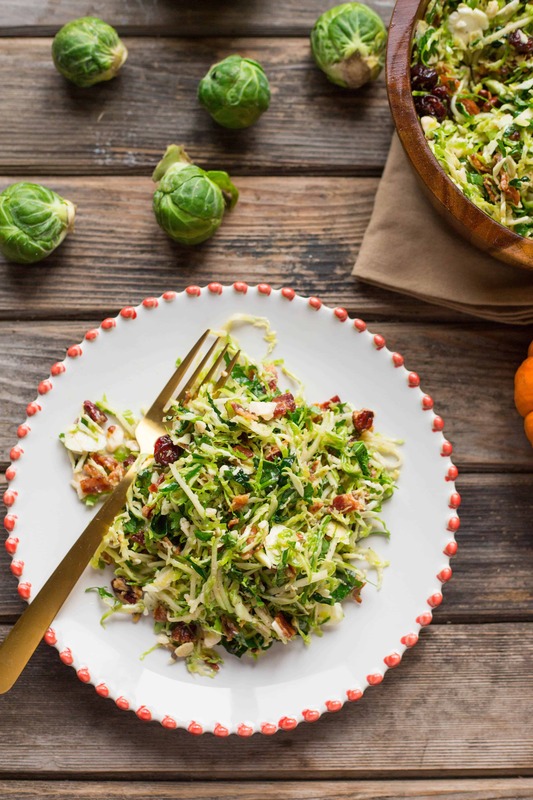 The kale and brussels sprouts can be shredded the night before. Massage right before serving. I’m so glad that you did the work to get this recipe out of your head and in to print. THANK YOU! What a beautiful dish. As much as I love all of the comfort foods that come with the holidays, I start to crave (to need!) vegetables. Loving the combination of flavors and textures too. Thanks, Marissa! I hope you give it a try – it’s a total crowd pleaser! Those photos are BEAUTIFUL! I always make a big salad the night before Thanksgiving. I can’t wait to give this one a shot. I saw some pretty Brussels sprouts still on the stalk at Whole Foods yesterday and I’m kicking myself for not buying them. I guess I have to go back. Thanks, my dear! I love those giant stalks of brussels sprouts. I was hoping to have some in my garden this year, but I’ve had a lot of trouble with my sprouts. Who knows, if we have a super mild winter again, I might just have some later this spring! Fingers crossed. This salad sounds incredible, Nicole! 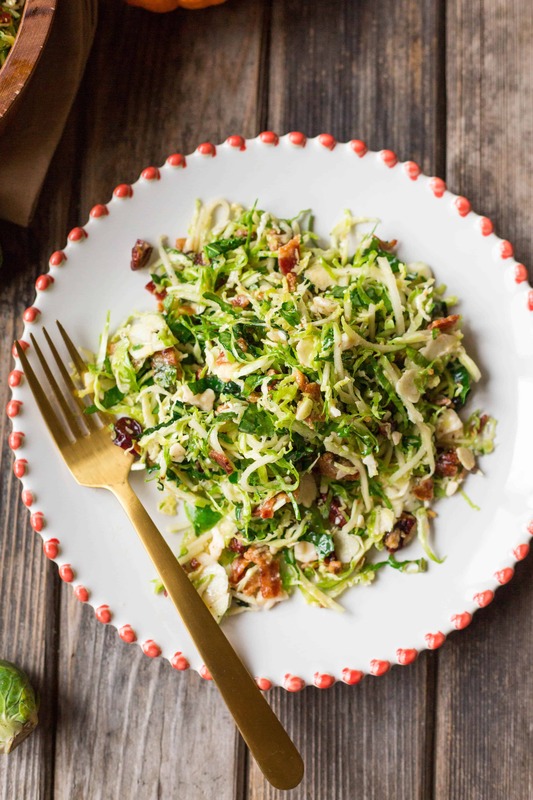 I’m down for anything with Brussels sprouts and bacon.